Last night I attended a FREE Ledisi + Anthony David concert as part of the ongoing Celebrate Brooklyn! Summer Concert Series @ Prospect Park Bandshell. Admission is always FREE, but you can donate $3 if you like(the parks are perpetually hit by budget cuts). I'd highly recommend you check this venue out @ least once this Summer. 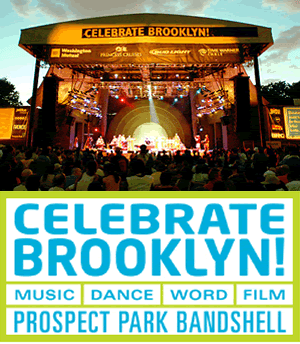 Celebrate Brooklyn! performances are actual concerts, not the stop and start touristy Good Morning America nonsense(dare I call them concerts) that are at 7am when you could be sleeping. There are some amazing artists + bands lined up this weekend and even more as Summer rolls on (I'm personally looking forward to Raekwon on July 9th). Most performances are at 7:30pm, but check the full SCHEDULE here. The entrance to the Prospect Park Bandshell is located at Prospect Park West & 9th Street in Park Slope, Brooklyn. The best way to get there is the F or G TRAIN to 7th Avenue. Exit at at the front of the Brooklyn-bound train leaves you at 8th Avenue and 9 Street. Walk 1 block to park's 9th Street Entrance or you can always HopStop Directions.